Kills moths, eggs & larvae safely. 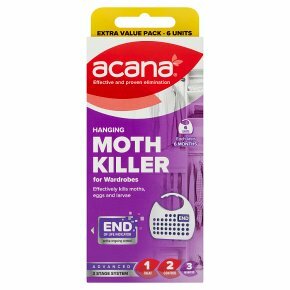 Optimised dynamics.Acana Hanging Moth Killer & Freshener uses the latest technology to provide long-lasting protection from moths, their eggs & larvae. Additionally, the lavender perfume with natural oils, freshens continuously. Each unit lasts up to 6 Months* and has an automatic end of life indicator, to confirm in real time, when it must be replaced. The active ingredients are sealed away in a specific plastic holder, which controls its diffusion for consistent performance, whilst avoiding any direct contact with clothes or hands. Each unit covers approximately 0.50 cubic metres. It is recommended to use 2 units for the average size wardrobe or a single unit when placed amongst clothing in drawers. Specially designed to be hung amongst stored clothing:- ideal for wardrobes and rails. Will not stain. Ideal to protect all clothing including woollens, cashmere, linens, furs, leathers and even silks. Complete protection for total peace of mind. *Dependent on area, temperature and airflow. Directions 1 Remove units from sealed bag. 2 Do Not open the plastic holder(s). 3 Hang unit(s) un a wardrobe on the clothes rail, using integrated hanging hook. Please see opposite side panel for typical application rates. 4 Replace when Renewed indicator shows "End" which usually appears after 6 months. Please use all year round to be sure of complete protection of your valuables. WARNING<br><br>STATUTORY CONDITIONS OF APPROVAL RELATING TO USE:<br>FOR USE ONLY AS INSECTICIDE. USERS MUST COMPLY IN FULL WITH THEIR LEGAL RESPONSIBILITIES UNDER THE CONTROL OF PESTICIDES REGULATIONS 1986 (AS AMENDED), INCLUDING COMPLYING WITH ALL CONDITIONS OF APPROVAL. ONE UNIT TREATS 0.5 CUBIC METRES OF SPACE FOR APPROXIMATELY 6 MONTHS. USE ONLY AS DESCRIBED ON LABEL. READ ALL PRECAUTIONS BEFORE USE. HSE: 9476. PCS: 97546. TO AVOID RISKS TO MAN AND THE ENVIRONMENT, COMPLY WITH THE INSTRUCTIONS FOR USE. Contains: TRANSFLUTHRIN 0.130 w/w (or 18mg/unit).<br><br>Causes serious eye irritation. Very toxic to aquatic life. Toxic to aquatic life with long lasting effects. Keep out of reach of children. Wash contaminated skin thoroughly after handling. IF IN EYES: Rinse cautiously with water for several minutes. Remove contact lenses, if present and easy to do. Continue rinsing. If eye irritation persists: Get medical advice/attention. Collect spillage. Dispose of contents/container in accordance with national regulations. Contains: Coumarin. May produce an allergic reaction.